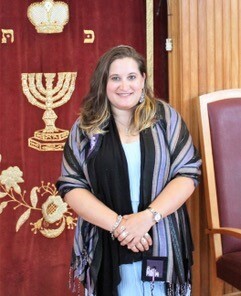 Rabbi Emma Gottlieb was ordained from the Hebrew Union College – Jewish Institute of Religion (NY Campus) in May of 2010. Born and raised in Toronto, Canada, she has served as rabbi in Plattsburgh, NY, and Canton, MA as well as in her hometown. Prior to her rabbinic studies, Rabbi Gottlieb earned a dual bachelor’s degree in Religious Studies and Vocal Music and she holds a Masters degree in Hebrew Letters from HUC-JIR as well. Her rabbinic thesis was focused on the doctrine of resurrection and how it is used and thought about in the Jewish liturgy of the Reform and Progressive movements . Rabbi Gottlieb is thrilled to now be living and working in Cape Town at Temple Israel CTPJC. She is a member of the South African Association of Progressive Rabbis (SAAPR) as well as the Central Conference of American Rabbis (CCAR) and the Women’s Rabbinic Network (WRN). Rabbi Emma is passionate about creating opportunities for Jewish engagement and teaching about how Judaism can bring meaning to our everyday lives. She looks forward to representing Progressive Judaism and women in the rabbinate throughout Cape Town and South Africa.